Contact: Sgt. James Nicholson at [email protected] or Sgt. Brian Narkewicz at [email protected] for more information. mdpolygraph.org for the latest information. Training to be held at the Mainstay Suites in Pigeon Forge, TN. If you have any questions feel free to contact me through this email or cell at 615-766-2737. This training session integrates practical exercises during eight hours of lecture and discussion of implementation of the Empirical Scoring System - Multinomial (ESS-M). Successful graduates will recognize the benefits of using ESS-M and be able to confidently implement or transition to ESS-M upon return to their polygraph suites. Successful implementation includes being able to write and explain ESS-M reports, being able to identify and use the correct multinomial distribution table, and being able to provide quality control of ESS-M report narratives for oneself or other examiners. 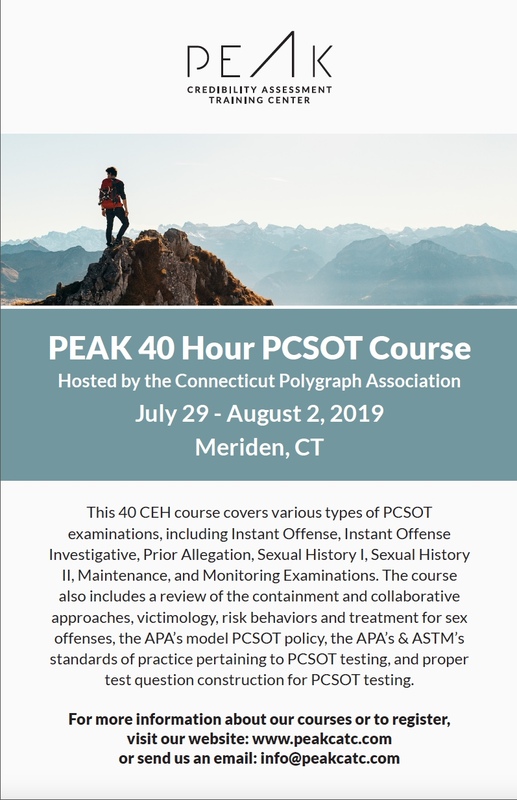 This training strongly supports the intent of the American Polygraph Association (APA), American Association of Police Polygraphists (AAPP), and Illinois Polygraph Society (IPS) in promoting widespread adoption of evidence based practices. Attendees will receive digital take-home materials consisting of a copy of the presentation and a MS-Word ESS-M report template. This course may include printed handouts and a graded final exercise. Rooms have been blocked for the Illinois Polygraph Society at a discounted rate of $89.00 per night. This seminar is FREE to all 2019 paid IPS members. Fee for non-members $75.00 day of seminar. Main subjects: APA recognized polygraph techniques and their validity studies. Pre-employment screening and interviewing "A Different Approach"
This seminar will provide up to 32 continuing education hours through the American Polygraph Association (APA) and the Arizona Polygraph Association (AzPA). The Northwest Polygraph Examiners Association will hold its 2018-19 Winter Seminar in Hood River, Oregon on January 26th – 27th, 2019 at the Hood River Inn in Hood River, Oregon. Reservations can be made by calling the Hood River Inn at (541) 386-8904. A special rate as low as $84 per night depending on room type has been negotiated. The cost of the seminar is $100 for members and $150 for non-members, and includes twelve hours of APA approved CE training, daily coffee bar, one hosted meal, and admittance to our now infamous hosted hospitality room each night where you can meet and mingle with our members. Come talk polygraph with some of the best examiners in the world! Registration information can be found on the NPEA web site at www.nwpea.net.